For those of you who don't know where UC Irvine is (home of Talking Brains West), we are on the coast right in the middle of the So. Cal. 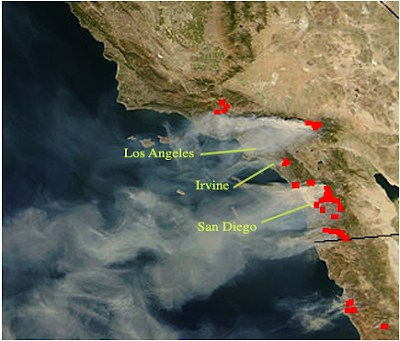 inferno, between L.A. (~40 miles north) and San Diego (~80 miles south). Some friends and colleagues have been contacting me about the fires, so I thought I would provide an update. The City of Irvine is currently not directly threatened. However, one of the fires is in the foothills of Orange County not too far away. As you can see from the satellite image taken yesterday afternoon , the brunt of the fire storm is to our north and south, but there is still plenty of smoke in the air with ash falling like a light snow dusting. It feels pretty severe here today. I can't imagine what it must be like in some of the more severely affected areas. A current (10/24) message regarding the state of the campus from UCI's chancellor can be found here.